Don’t throw away those empty TP and paper towel rolls, you can create wonderful projects up cycling them. Here is an adorable example using TP rolls. Just gather the materials and the kids and create! Step One Punch a hole in the top and bottom of each of your cardboard tube strips. Step Two Pour the corn syrup, Cheerios, and birdseed into three separate bowls. Step Three Using a paint brush, paint the outside of a cardboard tube with corn syrup, the more the better! Alternatively you can roll the tube in the corn syrup to coat the outer surface, this is a quicker way to do it. Step Four Dip your sticky tube into the birdseed. If you use a Tupperware container you can put the lid on it and shake the birdseed and tube around to cover the tube. Once covered, place the tube on the wax paper to dry. Step Five Repeat corn syrup and birdseed steps with more tubes. Step Six Cut a length of string and thread a Cheerio on it. Pull string through the bottom hole of one birdseed covered tube. Thread on 5-10 Cheerios then thread the string through the upper hole. You can add more tubes onto this string or move on to another string. Repeat this until you have about 6 strings completed. Step Seven Now it’s time to start putting the mobile together! Cut three long strings. Tie one string around one branch and repeat with the other two strings/branches. Gather the three strings together and knot at the top. Tie a loop with the excess string. If you don’t use a loop at the top your mobile will overturn if any weight is put on it. Hang it up in an easy to reach spot. Step Eight Tie your birdseed covered tube strings to the branches. Make sure they are secured tightly.Try not to dangle them too far from the branch or it will be hard for the birds to get to the seed. Step Nine Trim all your excess string and hang the mobile in it’s final position. Now enjoy watching the birds flutter around it and attempt to eat birdseed off a swinging mobile….if they can’t do it, they will knock the birdseed off the tubes and eat it from the ground. Hey, sometimes design is pretty not practical! Next Photo Of The Day! Oh, I am so glad you liked it! Kids would love this project too! 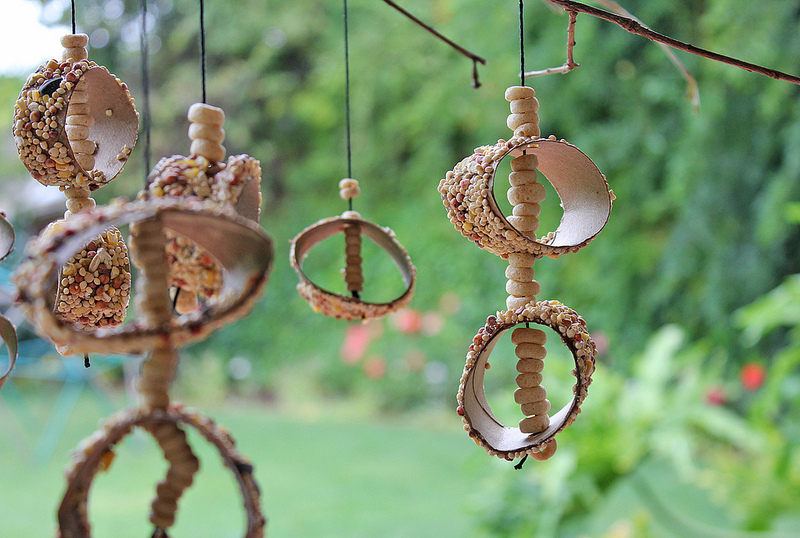 Love your idea with the birdfeeder. If you can add a small water feature, even a resin birdbath, would really attract the birds. Of course, in my yard some were an accident. My Pom goes to the birds every year, that saying once the birds are in your yard, put hummer and bird feeders that cling onto your window, and you could really enjoy!